Oruro, located high on the Andean highlands (the Altiplano - or High Plateau) is just a short bus ride (about 3 hours) from the city of La Paz. 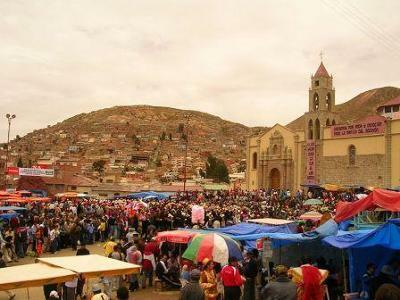 At 3709 meters above sea level, Oruro is best known for its authentic folklore festival, the Carnaval de Oruro. Here the weather is cool to cold year round. It rains quite a bit during the summer (December to March, also the rainy season) and icy cold winds can cause temperatures to plummet at night to below freezing. August to November, just prior to winter (also known as the dry season although in Oruro it tends to rain) are the mildest months of the year. Between September and April average temperatures are 64ºF (18ºC)while between the average temperature between April and August is 57ºF (14ºC). Return to our Climate Home Page for more details about the seasons, weather and climate in La Oruro, Bolivia.